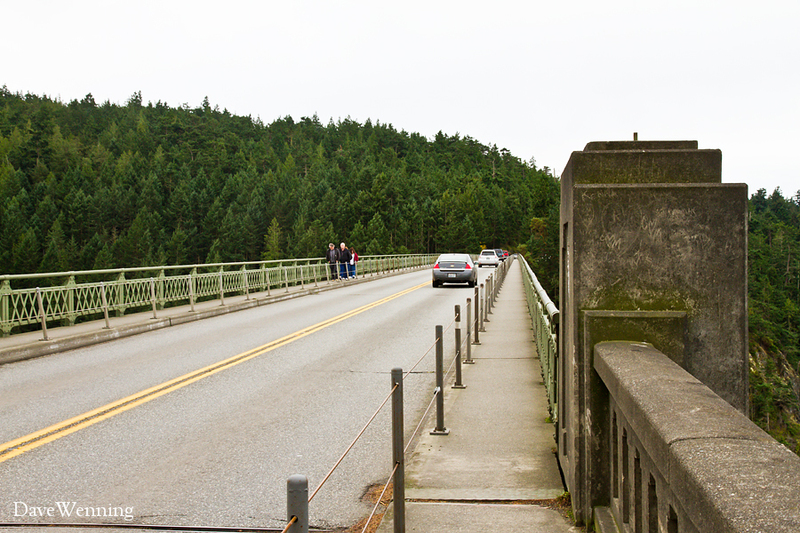 Visiting Deception Pass State Park seems to have become a Thanksgiving tradition for me. Last year it was quite windy, but things were calmer this year. The sky was overcast, but the day brought a lull between a series of storms rolling in off the Pacific. Another storm with high winds and heavy rain is expected to arrive after midnight. November is usually our rainiest month. 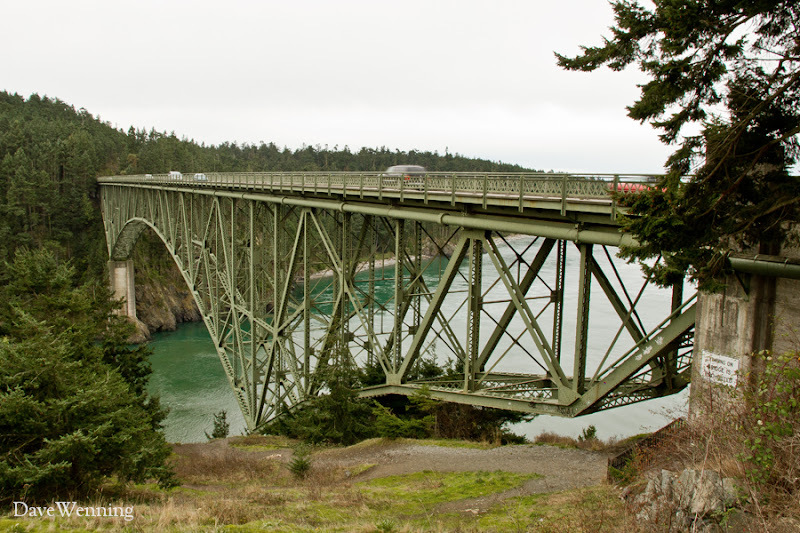 The state park straddles both Fidalgo and Whidbey Islands with the iconic Deception Pass Bridge connecting the two. More information about the bridge may be found in a previous post. Shades of gray and green are the colors of the season. I am told that artists appreciate the winter light here because it lacks harsh shadows. Of course we also enjoy those moments we call "sun breaks" when the clouds part, regardless how brief they may be. This visit also gave me a chance to try out a brand new Canon 7D camera. It is a step up from the T3i Rebel I have been using. The bridge provided a great subject to get some practice using the 7D. For gear heads, all of these test shots were taken with the Canon EFS 15-85mm f/3.5-5.6 IS USM UD wide angle zoom lens. I managed to capture a bit of motion in this photo. 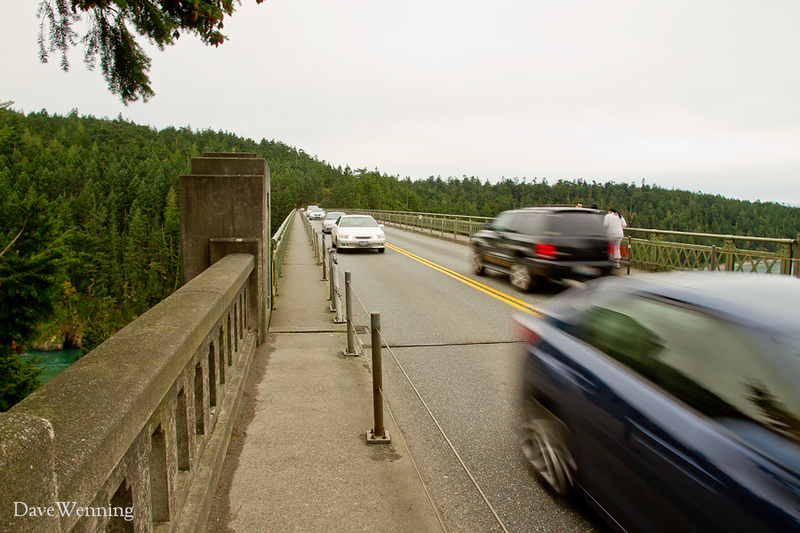 There is always a lot of traffic on the bridge which experiences an average of 20,000 crossings each day. With these shots, I am also experimenting with the raw image format which I have never used before. I am a bit shaky with the raw image converter in Photoshop. I am looking for a good tutorial or book which explains how to apply the various settings. I would enjoy and appreciate any suggestions posted in the comments. I have the text Photoshop Elements 10: The Missing Manual which describes the settings, but it doesn't reveal how to use them. This is the view east from the long span. Skagit Bay is beyond the two points in the distance. Kiket Island is visible between the points 3.5 miles/5.6 km away. 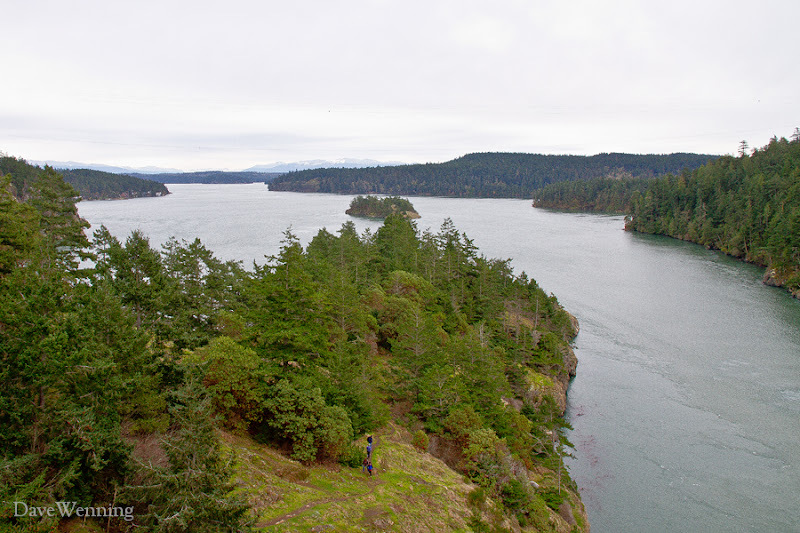 Deception Pass is the narrow waterway on the right. Thanksgiving Day provided a rain-free opportunity to get outside this year. I eagerly took the opportunity to get some practice with the new camera. The 7D is a wonderful camera and I can already tell that I am going to enjoy using it.